Our opening glass wall systems have transformed the hospitality industry by creating a dramatic indoor/outdoor experience, ensuring a memorable lasting impression for guests. NanaWall Systems will attend the Hospitality Design Exposition from May 4-6 in booth #9129, showcasing how its opening glass walls offer hoteliers the ability to quickly reconfigure a space, while also elevating the architecture and design of a hotel or resort to provide a luxurious, premier experience. 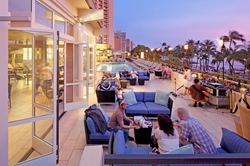 NanaWall offers durable, long-lasting glass walls with superior weather performance regardless of the season or climate, so hotels and restaurants can bring the outdoors in during the summer, yet have protection and warmth during the winter. The systems also provide the versatility to quickly change the configuration of an area—such as a restaurant entrance, lobby area, or event room—due to weather or time of day. The company offers aluminum, wood-framed, clad, and all-glass products, which continue to lead in performance, aesthetics, and durability. As the leading innovator of the opening glass wall category, NanaWall Systems will highlight the NanaWall SL60. This system delivers superior weather performance, exceptional energy efficiency, beautiful aesthetic design, and provides the option of Floor Supported Technology. The SL60 is available to open inward or outward, offering maximum flexibility for each project’s design. It also offers swing door capability—either attached to the side jam or within the chain of folding panels. For more information about NanaWall Systems and its products, please visit nanawall.com. Celebrating its 30th anniversary, NanaWall Systems redefined the category of opening glass wall systems. During its 30-plus years in business, the company has earned the trust of architects, builders, design professionals and homeowners as a custom solution for re-imagining how buildings, people and the elements interact. By combining precision engineering and outstanding design options throughout more than 25 unique award-winning systems, NanaWall Systems advances design possibilities beyond the conventional for almost any space. NanaWall Systems is headquartered in the San Francisco Bay Area, with 22 showroom and design studio locations across North America. NanaWall Systems is the exclusive North American partner of Solarlux Germany, the world leader in opening glass wall technology.